Yesterday we headed upstate a bit to the Long Beach Comic Book Convention. For this con we decided to bring everyone ( including my brother-in-law, Rob) so we piled six of us into a sedan and away we went for a two hour drive towards LA. The children were almost shockingly well behaved for such a long journey in crowded conditions (they must be coming down with something). Anyway we went in to register and immediately ran into Seth Green (famous movie star, cool!) and he was awesome enough to pose for a photo for me (I'm behind the camera). Here's Mike, Seth and Phoebe (and of course, Marshall, our Czech friend). This convention was really nice and low key and we got lots of pictures of the kids posing with various colorful characters. "Take a picture we will!" 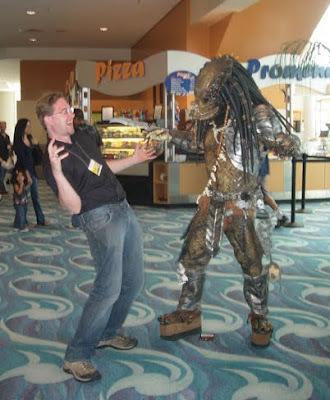 Here's Mike goofing around with "The Predator". Mike once, drew some covers for a comic with this guy in them for Dark Horse (Publishing company). We ran into many friends there. 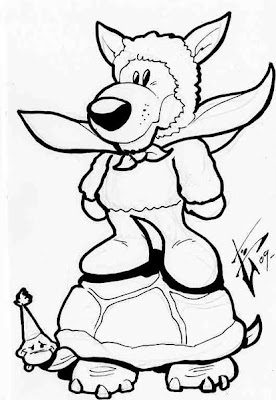 This is one of them, cartoonist Ben Glendenning, he agreed to draw a picture of Marshall for the girls. We also saw an old friend of ours from school, Brett Lewis who I hadn't seen in 16 years. He writes for all the big companies now, and except for the hat, looked exactly the same!